Brazil’s native flora has amazing diversity with differing biomes, including tropical rainforest, subtropical forest, tropical savanna, mangrove forest, tropical dry forest, wetland, and savanna. Of the approximate 400,000 known plant species in the world, 55,000 are endemic to Brazil, and most of these are from the Amazon forest. 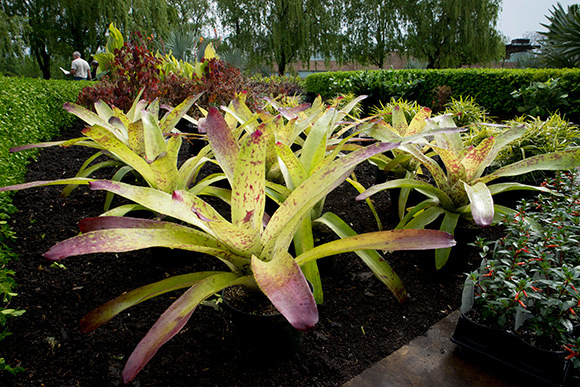 Bromeliads abound this summer throughout the Garden. 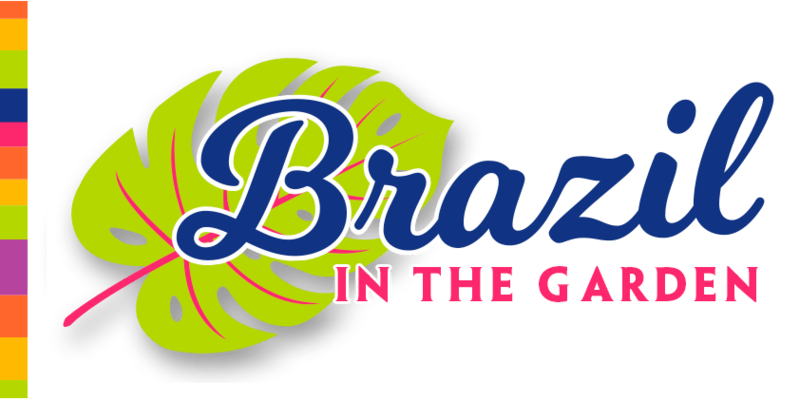 There are more than 3,000 known species of bromeliads; 650 of these are native to Brazil. Many bromeliads have leaves that are spiraled and called a rosette. At the base of the rosette, the leaves may grow in an overlapping and tight form to become a place for water to collect. Many of the foods we eat (like acai), industrial products we use (rubber tree and mahogany), medicines—even our houseplants in the Chicago region (orchids), depend on plants from this region. The unique flora of this area continues to be threatened by deforestation and urbanization, and plant species are at risk. Books on display through October 15, 2017, in the Lenhardt Library’s Flora Brasil exhibition depict a plant exploration map, Brazilian aroid, and Brazilian bromeliads. 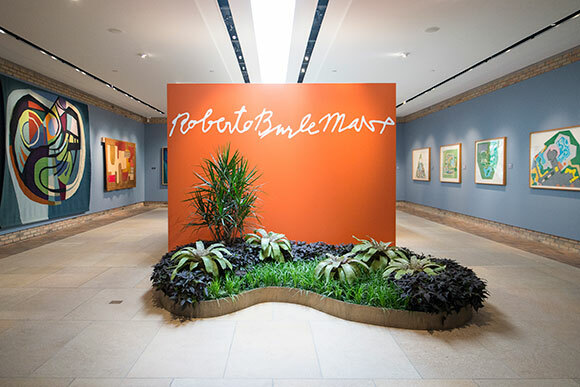 An untitled original artwork by Brazilian landscape designer Roberto Burle Marx on loan from Longwood Gardens complements our main Joutras Galley exhibition of Marx’s work. 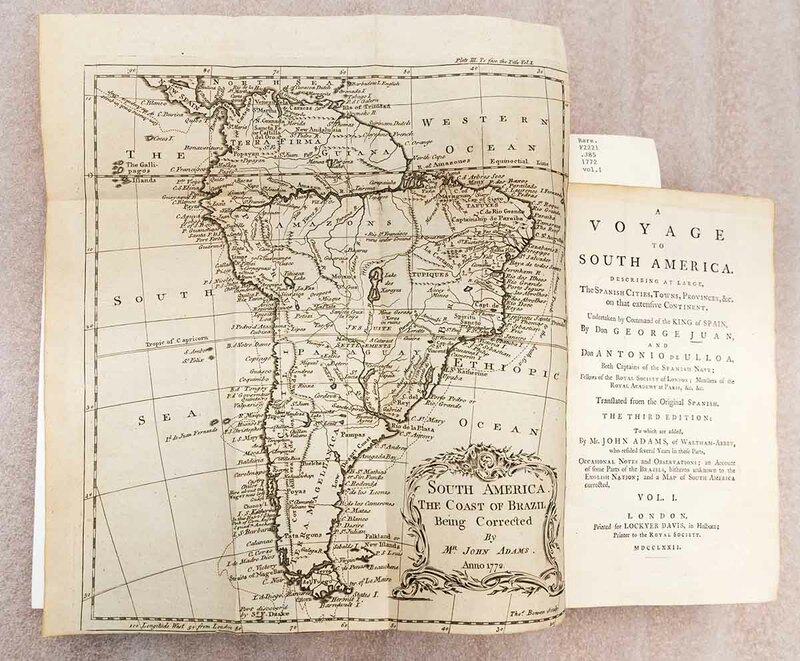 The library exhibition opens with an eighteenth-century map of South America with “the coast of Brazil being corrected” bound into the third edition in English of Voyage to South America: Describing, at Large, the Spanish Cities, Towns, Provinces on That Extensive Continent by Don Antonio de Ulloa and Don George Juan, 1772. Ulloa and Juan explored the region, observing and describing the flora, fauna, geology, minerals, indigenous population, and politics they encountered. Philodendron cannaefolium ‘Burle Marx’, a 24” x 30” detailed chromolithograph that is both scientifically accurate and stunning from Aroideae Maximilianae by Heinrich Schott, 1879. 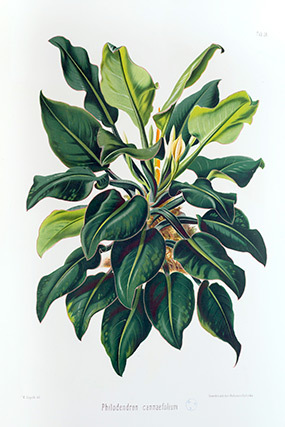 A Brazilian aroid Philodendron cannaefolium (today known as Philodendron ‘Burle Marx’) is the centerpiece with a 24-inch-by-30-inch detailed chromolithograph that is both scientifically accurate and stunning. This 1879 work, Aroideae Maximilianae by Heinrich Schott, features 42 plates with delicate colors and clean lines. Schott was an Austrian botanist who traveled in Brazil from 1817 to 1821. He specialized in Araceae and throughout his career, he named 587 new-to-science species of aroids; by comparison, Linnaeus named six aroid species. Come also learn about Margaret Mee, who was an exceptional botanical artist, plant explorer, and environmentalist. 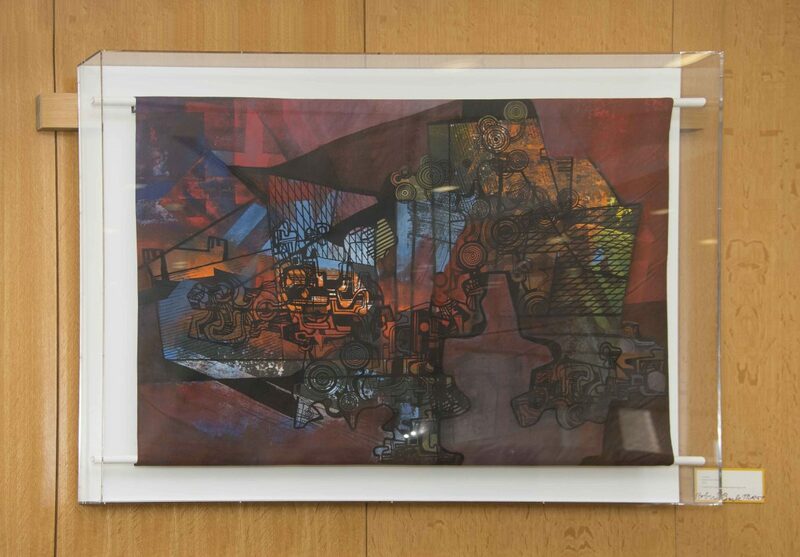 Four reproductions of Mee’s “Brazilian Bromeliads” are on view. These are from a limited edition set published in Brazil in 1992. Mee traveled to Brazil often, and went on fifteen botanical expeditions, mainly into the Amazon region. On these expeditions, she discovered several new plant species, painted more than 400 gouache pieces, and kept travel diaries detailing her adventures. Her passion for Brazilian flora coincided with the large-scale commercialization of the Amazon rainforest. She became an outspoken environmentalist, calling attention to the dangerous destruction of the biodiverse region. 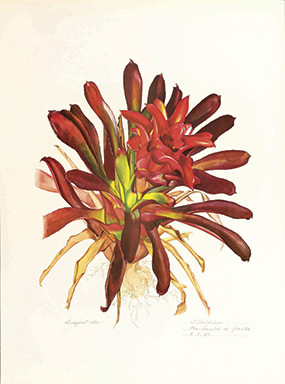 Margaret Mee’s Nidularium innocentii from Brazilian Bromeliads, reproduction, limited edition set published in Brazil, 1992. 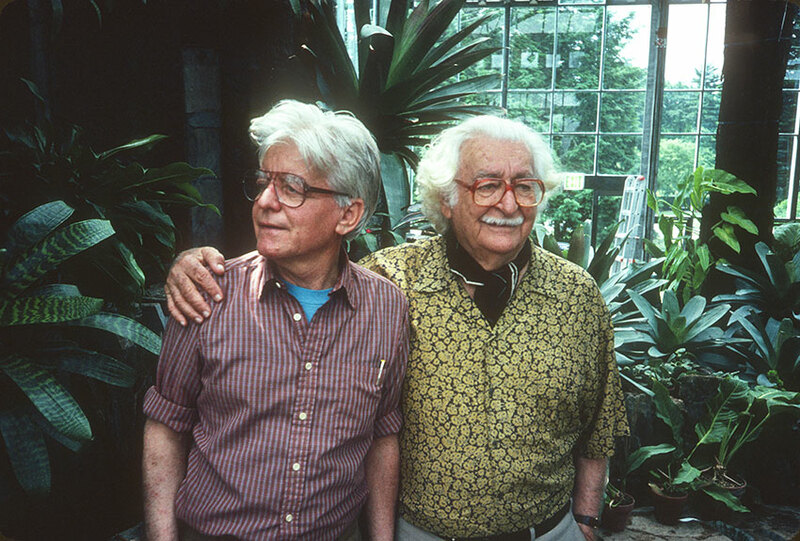 Noted Brazilian landscape architect Roberto Burle Marx cultivated plants that Mee brought back from her expeditions and used them in his landscape designs. Known for his bright and bold color choices, Marx was inspired by Mee’s paintings. Like Mee, he was concerned about the environmental impacts of the commercialization of the Brazilian Amazonian region. Learn more about Mee, Marx, and Brazilian flora at our free Library Talks on July 16, August 22, and September 12 at 2 p.m. in the Lenhardt Library.